Artsplosure – Is right around the corner! This Raleigh Arts Festival is celebrating 32 years of inspiration, art and culture in the Raleigh area. It all starts Thursday, May 19, and lasts until Sunday, May 22, 2011. 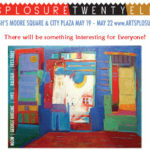 It will be held in the historic Moore Square downtown Raleigh and in the City Market. There will be truly something interesting for everyone! The festival this year includes many activities within each of these categories, The Art Market (filled with every kind of artwork you can imagine), Music in the Park (Sat & Sun only), Kidsplosure (association with Marbles Kids Museum) and finally the amazing Amacoco in City Park.